← One Big Pair of Underwear Blog Tour: To Send or Not Send. That is the question. In response to that item, my friend author Mary Bowman-Kruhm asked for general guidelines. She said in a comment to the post, “Since a writer is seldom in contact with an illustrator, it’s difficult to know the parameters of what to include, what the illustrator will do. And obviously some illustrators are better at teasing out important tidbits of content than others.” So I thought I’d expand on that issue in today’s post. To start with, as a general rule picture book text need to be very spare; each word has to be well-chosen and absolutely necessary to the story. Therefore, if the writer includes visual details that could be illustrated, those words are superfluous and perhaps should be eliminated. 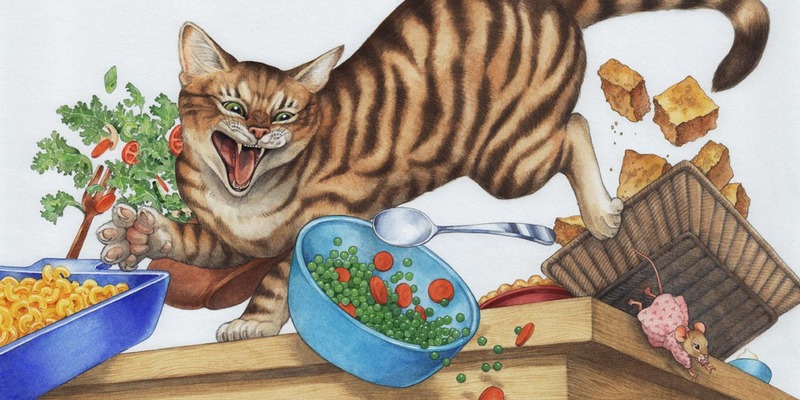 For example, in my book Fine Life For A Country Mouse, the full page climax of the story is of a cat leaping onto a table, knocking dishes and food in all directions and causing Tillie mouse to run for her life. My manuscript and dummy included one word on the page, “CAT!” But my wise editor Bonnie Bader knew it was not needed, and cut it. This illustration required no words. The cat is mentioned in the following page’s text describing the chase. Such a wordless page can be indicated in a manuscript by the use of illustration notes. These notes are to the editor and the illustrator; they are included in the manuscript within double parentheses, which indicate “do not set.” However, writers should use illustration notes sparingly, according to what I have heard from industry professionals. “The point of an illustration note isn’t to jot down every single thing that’s in your imagination. It’s also not to micromanage the potential illustrator. The point of an illustration note is to convey something to the manuscript reader that is not obvious from the text. “Publishers generally do not expect or need illustration notes or suggestions to accompany a picture book manuscript. Editors are used to working with these manuscripts in unillustrated form, and can visualize how they would be illustrated, and the book laid out, without any help from the author. In fact, since they are used to working with such manuscripts, they are likely to be better able to visualize a given manuscript than that manuscript’s author. As an author/illustrator, I usually don’t need to use illustration notes on my manuscripts because I submit dummies, but I do have to be careful to avoid including words in my text that can be illustrated instead. I’d be happy to hear your thoughts and experiences on this issue! This entry was posted in Writing Tips and tagged Harold Underdown, illustration notes, KidLit.com, Mary Kole, picture book illustrations, picture book manuscripts, picture books, The Purple Crayon, writing children's books. Bookmark the permalink. Your advice runs contrary to the modus operandi of the staff childrens book editors and writers of a venerable animation studio here in Los Angeles. There were quite lengthy descriptions in the Art Notes and there would be a note to the illustrator on every page, unless it was meant to be a spread. The editorial staff left nothing to chance. I would get the manuscript and be told whether I was drawing a spread or a spot illustration. There was usually detailed description of the action, what expressions the characters had, even where certain characters should be in the layout. This micromanaging had a lot to do with the fact that they were basing much of these stories on pre-existing, well-known animations, rather than original stories. They publish hundreds of books, and I produced several titles with them. Every once in a while, you’d surprise them with an idea you’d sneak in there, but if you wanted to keep working for them, you kept such transgressions to a minimum. Yes, as an illustrator I have been given fairly specific art direction for other kinds of books — a series of Early Readers I worked on in 2005 comes to mind. I personally do not mind being directed, but many editors say that for trade picture books, they want the illustrator to have the freedom to interpret the manuscript without much input from the author. One editor I know has a rule against communication between author and illustrator until after the sketches are submitted.